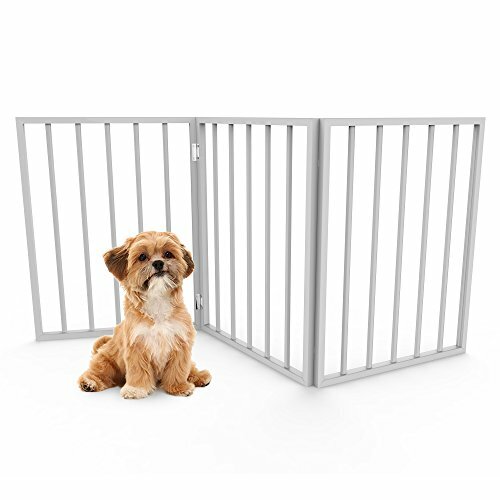 Keeping your pets where they belong has never been easier than with the Foldable, Free Standing Wooden Gate- Light Weight Barrier for Small Dogs / Cats by PETMAKER. The free-standing gate is designed to fold, which allows it to be light weight while maintaining sturdiness. This stylish, wooden gate will look great in any part of your home, and is perfect for blocking off doorways, hallways, and stairs. STORABLE: This essential puppy product is light weight and easily folds together for storing purposes. When folded, this gate is small enough to conveniently fit in the closet. STYLISH AND FUNCTIONAL: This pet gate is excellent way limit your pet's access to parts of your home, while maintaining a modern appearance. The white finish on this wood gate, is a more attractive alternative to the typical plastic pet or baby gates. REQUIRES NO INSTALLATION: Unlike traditional gates, this gate does not require installation that could potentially damage your home. With an accordion design, this pet gate is sturdy enough to barricade your small dog, puppy, or cat, without drilling. PRODUCT DETAILS: Color: Wood Finish: White. Materials: Wood and Metal (Hinges). Dimensions: Opened: 1 inch (L) x 54 inches (W) x 24 inches (H). Folded: 3 inches (L) x 18 inches (W) x 24 inches (H). SATISFACTION GUARANTEED: PETMAKER is committed to providing consumers with the absolute best price and value on our products. NOTE: This is an exclusive product of PETMAKER and ONLY Foldable, Free Standing Wooden Gate are guaranteed to be genuine. If you have any questions about this product by PETMAKER, contact us by completing and submitting the form below. If you are looking for a specif part number, please include it with your message.